I've entered this tutorial into three Instructables contests. Please consider voting for it by signing up for a free Instructables account, heading over to my Instructable and voting in the upper right corner (or on mobile at the very bottom). Update: I won Third Prize in the 3D Printing Contest! Thanks to everyone who voted for me! 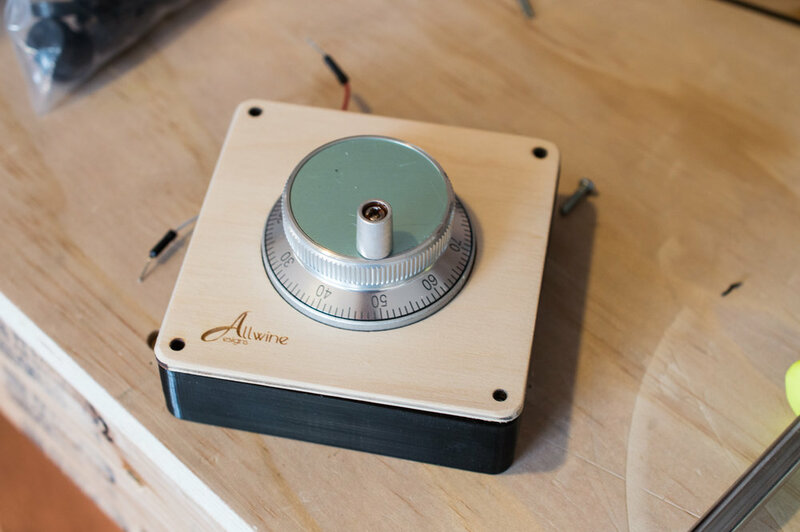 This tutorial explains how to use an Arduino and a rotary encoder to make your own mouse wheel and how to design an enclosure for it using Fusion 360. It also explains how to use your mouse wheel as a jog wheel for the Pocket NC. 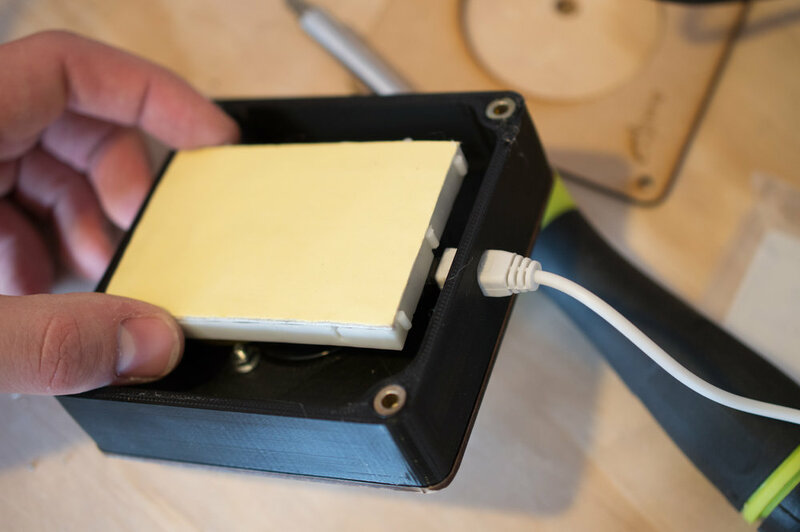 If you don't have a Pocket NC, the design and Arduino portions can still apply to you if you're interested in making a mouse wheel. The Pocket NC is a 5-axis desktop CNC machine made by a Bozeman-based company also called Pocket NC. The Pocket NC is an amazing piece of machinery. It's the only 5-axis milling machine on the market under $60,000 and the Pocket NC rings up at a fraction of that at only $4,900. It was successfully kickstarted a couple years ago and they're now going strong, having already completed a second kickstarter for a different machine while continuing to make Pocket NCs. If you own a Pocket NC, you know just how awesome it is, but there are a couple quirks about it that leave you wanting more. First, it doesn't have a jog wheel, which isn't a huge deal, but not having to worry about misclicking the jog button on the screen while your attention is on the material or tool would be very convenient. Second, its user interface is the default interface, called Axis, provided by the open source project LinuxCNC. To get it to run, you either need to hook up a keyboard, mouse and display to the machine (the easiest method), or enable X forwarding over ssh to your computer which has different issues on every OS. The most awesome part about the Pocket NC is its form factor and having to hook up a display, keyboard, and mouse adds some undesired bulk to the workbench, while also adding the hassle of having to transfer gcode over USB sticks. Hooking up to your own laptop is ideal, but the problems with X forwarding can be especially frustrating. In this tutorial, I'll show you how to address both of these issues by installing a new user interface on the Pocket NC that works through your web browser and also allows you to use your mouse wheel as a jog wheel. We'll create our own USB mouse wheel that is more reminiscent of a jog wheel. We'll start by designing an enclosure in Fusion 360, where I'll walk you through some parametric modeling. 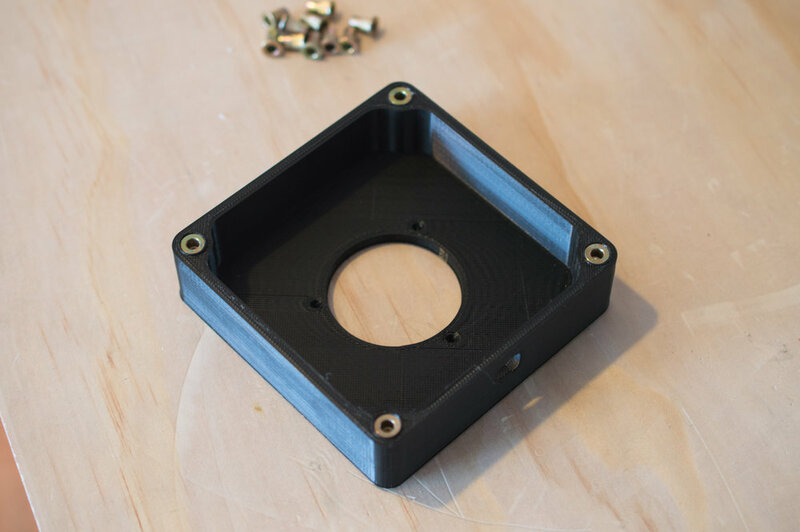 Then we'll 3D print the main enclosure, laser cut a top and bottom for the enclosure and assemble the electronics of the jog wheel. The brain of the mouse wheel will be an Arduino, which I'll show you how to code so it will send the mouse wheel events over USB. Finally, I'll show you how to back up your Pocket NC, then how to install the new user interface. Here's a quick example to explain the difference. Let's say we need a simple faceplate, which is just a rectangular piece of material with holes in each corner. 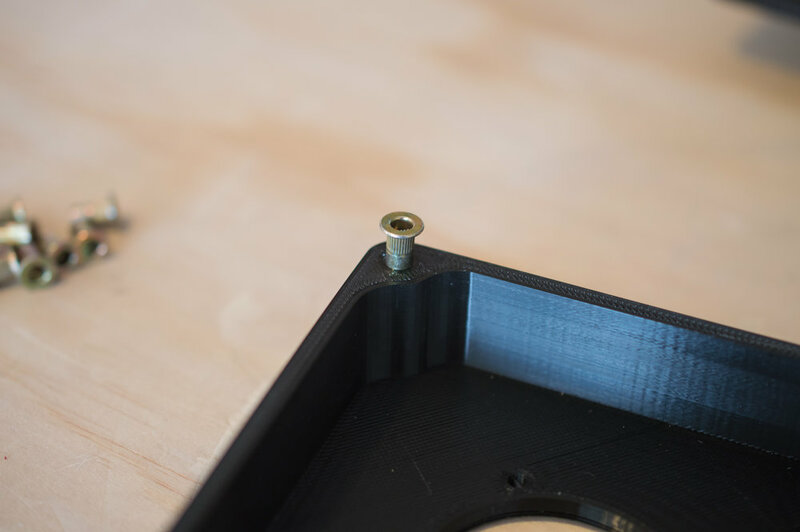 The one we need for our current design needs to be 4 inches square with the holes 1/2 inch in from from each corner. The designer figures he just needs this one design and quickly models it by creating the 4 inch square then manually places the center of the holes at (.5, .5), (3.5, .5), (.5, 3.5) and (3.5, 3.5). It's quick and easy and the design is done. Now let's say that the spec for the faceplate changes for some reason, and instead it's now 6 inches x 5 inches and the holes need to be 3/8" in from the corners. The design from before doesn't help us, as we need to perform all the steps over again from the beginning as all of our dimensions have changed. The model is so simple, it may not matter in this case, but a better way to have designed the model from the start would have been to define 3 variables, width, height and hole offset. Then a rectangular solid could be created using width and height and the holes could be placed at (hole_offset, hole_offset), (width-hole_offset, hole_offset), (hole_offset, height-hole_offset) and (width-hole_offset, height-hole_offset). Now if any of those variables change, the model is updated and you have a new part. The example above is very simple and the equations are easy enough to write out, but as parts get more complex figuring out the equations can be quite complicated. Good CAD software can quickly and easily define those kinds of relationships without needing to know the underlying equations. I'm a huge fan of parametric modeling because once a design is implemented it allows you to quickly adjust dimensions to suit your needs. It can take more time to properly design a parametric model, but it will save you time in the long run if you plan on doing several iterations of the design, or just want quick visualizations of what the design could be. I use OpenSCAD and OpenJSCAD often which are pure coding interfaces to 3D modeling. I love to code and am good at figuring out all the equations and variables to use, so using them for parametric modeling is a good fit for me. The coding can be a pain, though, and poorly written or poorly commented code can be a mess to debug and modify. CAD software provides a visual interface for setting up many of the relationships suited to parametric modeling, which can make the design process go much faster. I've been meaning to learn Fusion 360 for a while now, especially because of its integrated CAM software and 5-axis machining capabilities at the low, low cost of FREE (as long as you make under $100,000 with it). In the next section, I'll take you through the steps I took to design my enclosure. I'll show you how to take advantage of the parameters window and the dimension tool to ensure everything is parametric in nature. This is my first time using Fusion 360, so there are probably more efficient workflows and I appreciate any suggestions or other feedback. I kept the design simple so it could be created in a number of different ways. I chose to 3D print the middle part and laser cut the top and bottom plates. 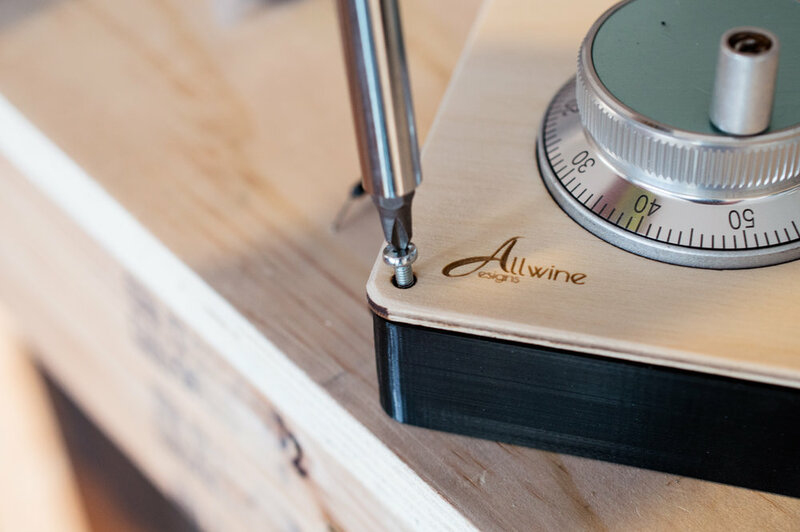 The whole thing could be milled or you could even forget this specific design and use standoffs between two pieces of plywood that were cut out with a jigsaw or just breadboard the whole thing without an enclosure. All the files are provided here for your reference and the video below will take you through the steps I took in Fusion 360 to make this design. 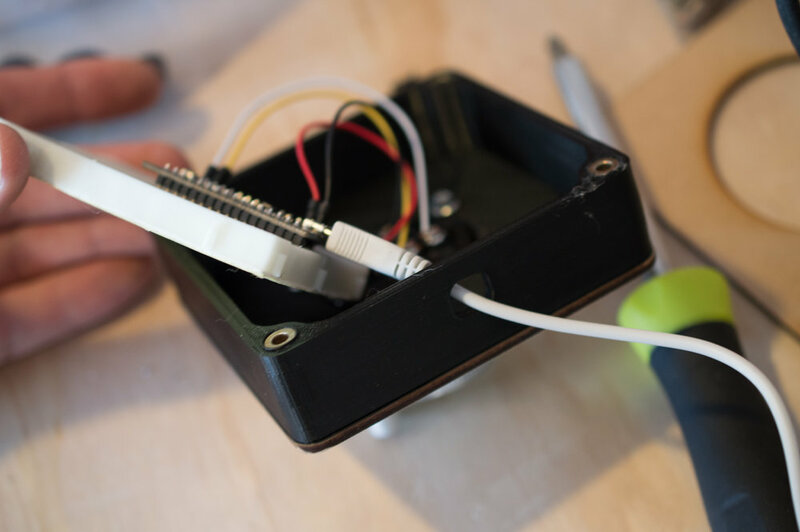 We'll get to the code soon, but first here's some information about how a rotary encoder works. We'll need this information when implementing our mouse wheel code below. 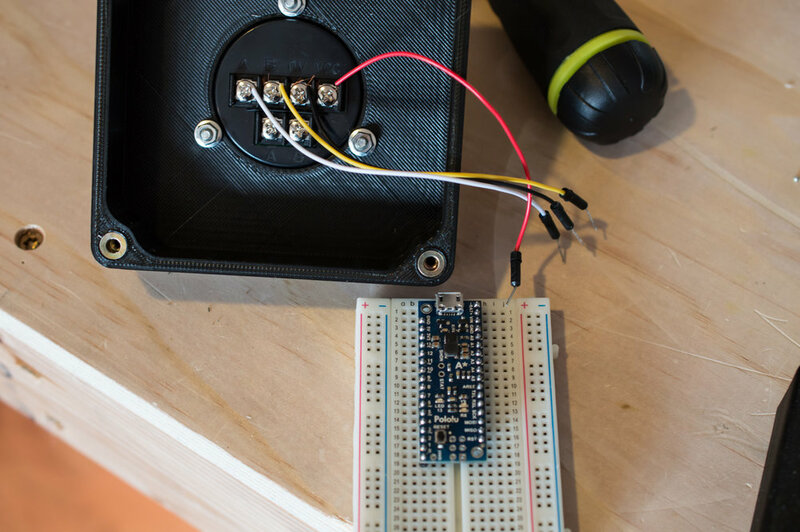 A rotary encoder outputs two signals, A and B, in a certain pattern that allows you to determine which way the knob is being turned based on the previous and current state of the two pins. So, whenever either signal from the rotary encoder changes we want to know about it. Hooking up the encoder to our interrupt pins allows us to do that. No matter what the Arduino is currently doing, a change on either of the interrupt pins will trigger a specific chunk of code to run. In that chunk of code we compare the previous and current states of the pins and increment or decrement a counter variable to indicate which direction we turned the knob. Below is an interactive widget that demonstrates the behavior of the rotary encoder. You can click and drag in the widget to spin the encoder and see how the A and B signals change. Notice how when the A and B sensors touch a blue pad they are 0, otherwise they're 1. The divots around the outer circle represent the detents of your encoder. On a physical encoder, the detents give the user some tactile feedback, as well as snap the encoder to a specific value such as 00. The value that the encoder snaps to can have ramifications on the power consumption of your circuit, which can be important in very low power circuit design. When going from one detent to another the A and B signals transition between the four different states listed in the middle of the widget below. Notice how when turning the encoder clockwise the pattern progresses to the right, and when going counter clockwise the pattern progresses to the left. When either A or B changes the combined state of A and B is checked against what it was just prior to the change and a counter is incremented or decremented depending on which direction the encoder was turned. When the next detent is reached the encoder was either incremented or decremented four times, at which point we can trigger a mouse wheel event, key event, volume event or anything else we want it to do! Like awesome projects like this? Subscribe to our newsletter to get quality, free projects in your inbox! Now we need to implement the widget's behavior on the Arduino. I started with a rotary encoder example from bildr.org (linked at the bottom), and modified it to suit my needs. I'll go over what the code does and then list the whole script so you copy it into the Arduino IDE. Make sure all the files aren't in a subfolder. 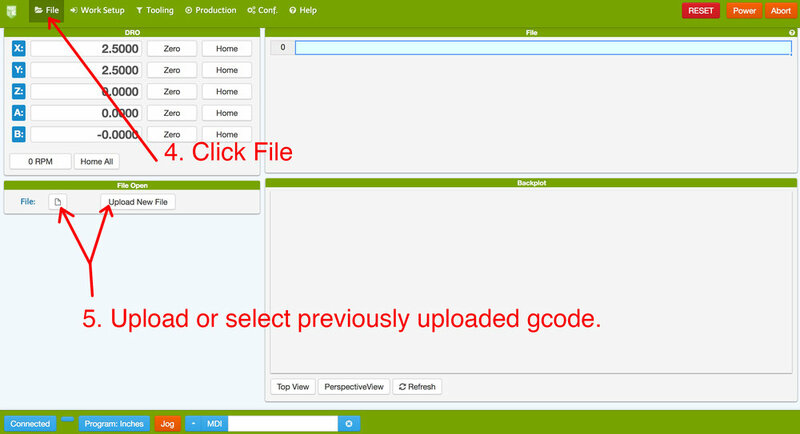 Eject your MicroSD card and prepare your PocketNC for backup. Home all the axes (make sure the A axis is at 0, or parallel with the ground). Power down the PocketNC and disconnect all wires to it. Turn it on end as shown in the images below. Unscrew the face plate with all the nasty warnings on it. Disconnect the mini HDMI cable for easier insertion and removal of the MicroSD card. Insert the MicroSD card, with the exposed metal connectors facing up. Power on the BeagleBone by either plugging in the power cord on the front of the PocketNC and turning it on, or by connecting the Mini B USB to your computer. The blue lights in the bottom left should blink for a long time (it could be as short as 10 minutes or up to an hour and a half, depending on the speed of your MicroSD card). Once the blue lights in the bottom left remain solid, unplug power from the BeagleBone and remove the MicroSD card. Blue lights will flash in the bottom left corner. When the lights go solid, you know it finished. Download and unzip the BeagleBoneFlasher.zip file, then copy its contents onto the MicroSD card (again, making sure its not in a subfolder). At this point, make sure you've backed up everything as we're going to wipe out your PocketNC and replace it with a new web interface. 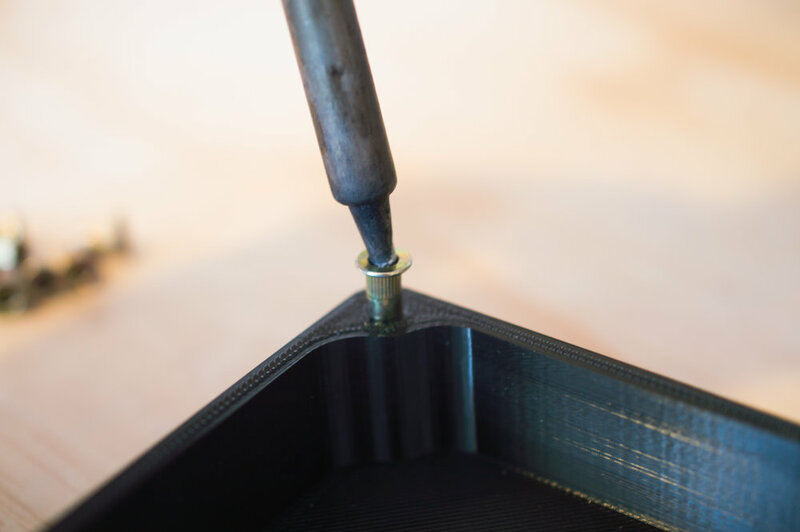 If there are specific gcode files that you'd like to keep, I'd recommend copying them off manually as it'll be easier to access them than going through a restore or mounting the back up image. Now that we're ready, insert the MicroSD card into the PocketNC and power it on. Again, it will flash in the lower right until it is done. This should go much faster than the backup (about 10 minutes or less). When it finishes, remove the MicroSD card, plug the HDMI cable back in and screw the faceplate back on. Now we need to copy your configuration settings back over. First, there's one line in the configuration file that we need to change using a text editor. You'll need a better text editor than notepad, so download notepad++ or any editor that says Yes in all 3 columns from this Newline support table. Open PocketNC.ini in the text editor you installed (it should be in C:\Users\<your username> unless you put it elsewhere).